You’ve received a letter in the mail, and it’s got your name on it — along with some specific claims about tax liabilities. What do you do? Some people fold up the letter, tear it in half, and throw it in the trash. Others check to see who it’s from, discovering that the Internal Revenue Service sent the note. A majority of people simply panic. And rightfully so. When the IRS says you owe more than you actually do, or owe more than you can afford to pay, it can be devastating. Not only will you feel overwhelmed, but your life will suffer, too. It’s best to pay your taxes on time and in the proper amounts; however, the criminal tax attorneys in Naperville at Tax Law Offices understand if you’re in a tight situation. In this post, we want to share with you the reasons why you don’t fight the IRS without a tax lawyer. We’re sure you’ll benefit from it. If you choose to take on the IRS alone or with your CPA, you forfeit attorney-client privilege. In a large majority of cases, your CPA does not have the rights to hold your communications with them in privilege like a tax lawyer does. For example, you could divulge your entire tax situation to your CPA, and the government can make the attempt to make them testify against you in court. When you choose to confide in a tax lawyer, instead, you’re protected. The IRS Tax Code is a complex beast. It functions to produce one result: collect the proper tax liabilities from citizens and business owners. What does this mean for someone like you, who is considering taking them on alone? It means that you’re going up against a system so large that you’re unable to see it for what it is. The tax codes and laws are complex and difficult. There’s no two ways about it. Unless you have years of experience with the IRS and knowledge on how their codes and laws work, you will soon find yourself in a sinking ship. When it comes to the IRS, deadlines are a hard standard. There are very few, if any at all, extensions or “forgiveness” when you miss a deadline. It’s a giant system that simply moves people along toward the giant end goal: Collections. When you miss deadlines, it only costs you more. Not knowing what the deadlines are is not an excuse to miss them, either. The IRS does have program setup for taxpayers to settle their liabilities; however, these programs must be applied for, and the IRS must approve those applying before the payment installments or reduced liability amount take effect. Once again, this is a process within a system that relies on complex tax code and laws to regulate. Navigating this on your own can cost you more than if you were to hire an experienced, reputable tax attorney in Naperville. An experienced, reputable tax attorney will be able to give you advice and guide you through the process. And if they don’t have an answer to a question, they know where to look. 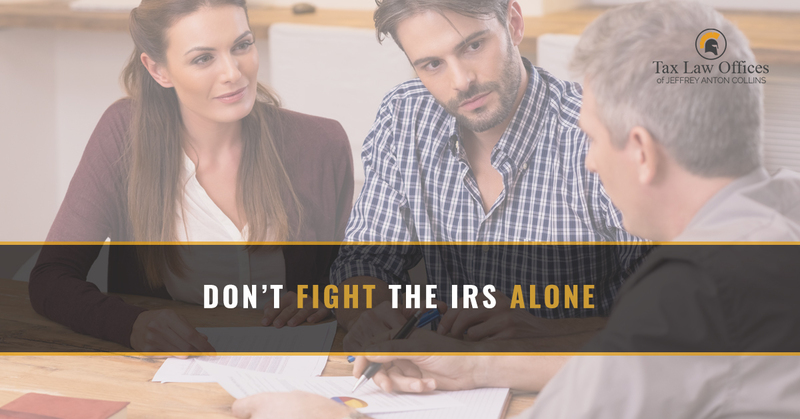 Fighting the IRS alone can leave you filtering through hundreds of documents attempting to understand which paperwork you need to file where. It’s a painstakingly dense process for those without tax law or code knowledge. You can represent yourself in a tax-related criminal investigation; however, at Tax Law Offices in Naperville, we strongly suggest you schedule a consultation if you’re a part of an investigation. A tax lawyer can help protect your right to freedom, self-incrimination, and false accusations. When a criminal investigation begins, it’s now about more than tax law and code. Do you need help with the IRS? Do you owe $100,000 or more in back taxes? Schedule a consultation with Tax Law Offices in Naperville today. It’s time you got your taxes in order and the IRS off your back.